The Gay Gamer: My prayers (may) have been answered: New Tingle game coming soon? My prayers (may) have been answered: New Tingle game coming soon? Considering the DS logo in the upper-left-hand corner, it seems to be a safe bet that the game will appear on Nintendo's world-dominating handheld (as opposed to its world-dominating console, the Wii), but that's about all that can be gleaned from the ad. 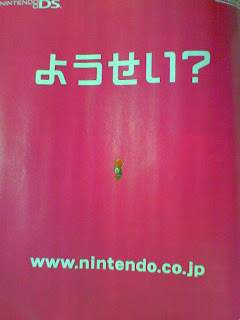 Upsate #1: The Japanese text above Tingle says, "Fairy?" Update #2: Nintendo of Japan has launched a website for this as-yet-unnamed game. Apparently, a trailer will be added to the site on June 18. USC students creating a "gay video game"